Sorta? Well, you know, next week's checklist will be published on Sunday, 31st January 2016 but will concern the first week in February, that poor, forlorn month with so few days. But I digress. This week takes a different tack - it's pay back time. Now to branch out a bit, we’re going to do some online indexing and have a little fun. 1. Volunteer at FamilySearch Indexing. You’ve probably heard about this massive project. Nearly 6 million records were indexed in 2015. There are currently 592 projects with varying degrees of difficulty. Multiple languages are offered, as wFamilySearch continues collecting records from countries throughout the world. If you are fluent in Spanish, go for indexing one of those record sets. This is a way for you to pay your dues, genealogically speaking. It is amazing what we can accomplish together. Do not worry. There are two people indexing each page, and an arbitrator that resolves any differences noted by the FamilySearch computers. Each month Cousin Russ and one of DearMYRTLE's very distant cousins records an indexing session. In the embedded video below, names were indexed as they appeared in a variety of obituaries. We all know how valuable obituaries are for providing clues about other family members. It only takes a few minutes to sign up as a volunteer and download the software here. 2. 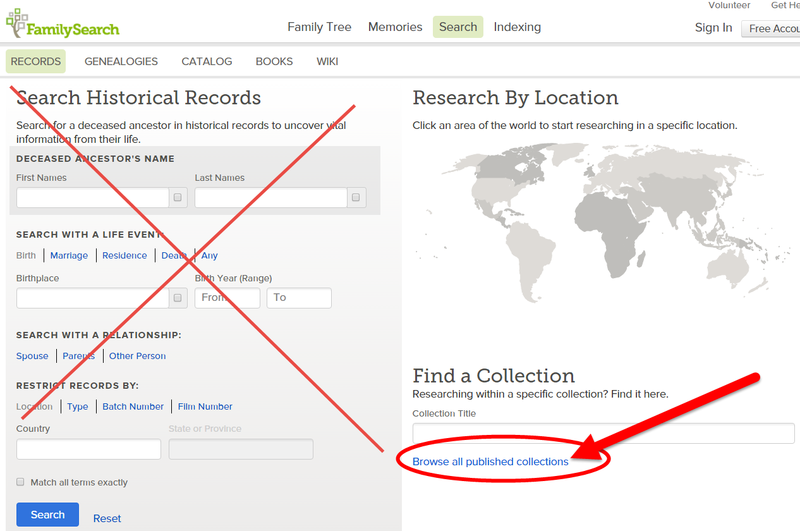 Learn to browse the image collections at FamilySearch.org . There's a method to Ol' Myrt's madness. Since the majority of the records at FamilySearch are not yet indexed, researchers must spend most of their time browsing, not searching by name. So do not type in an ancestor's name. Scroll over and down to click the "Browse all published collections" text. 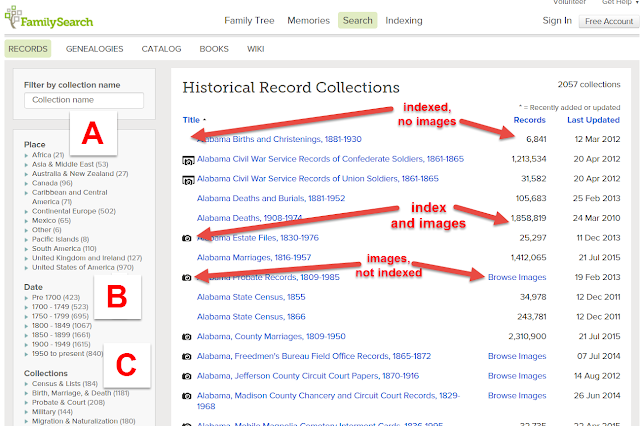 Alabama Births and Christenings 1881-1930 has no images but has 6,841 indexed entries. There is no tiny camera icon to the left of the collection title. Alabama Estate Files 1830-1976 has images and is indexed. See the tiny camera icon to the left of the collection title is present. 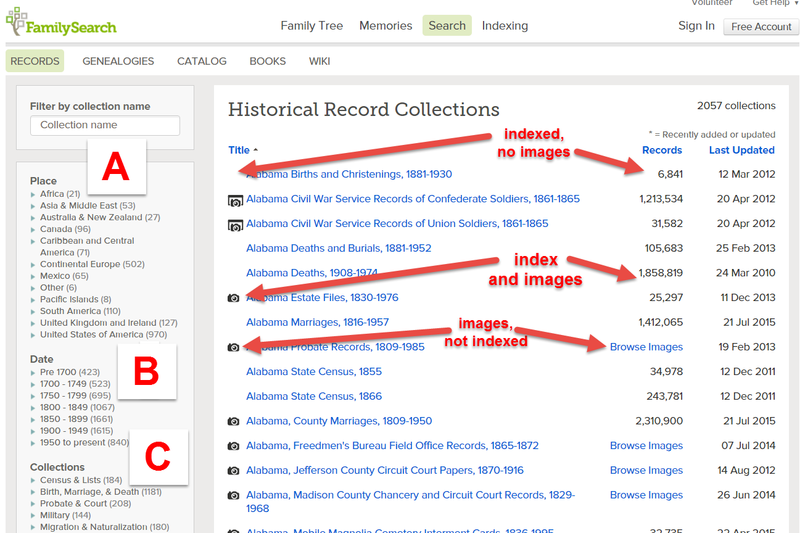 Alabama Probate Records 1809-1985 has images but is not indexed. See the text Browse images. 3. Create surname binders for yourself (if female) and your mother's maiden name, but leave them at that for the moment. No need to worry about color coding, we are making coffee table books for the non-genealogists in the family. 4. Update your genealogy program to include your siblings with birth and marriage information. Make sure photos and documents are transcribed and cited before attaching to the appropriate individuals as well. NOTE: We have not yet considered adoption, maiden names, filing of post-marriage documents, etc. 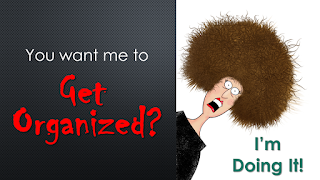 Look for that in upcoming DearMYRTLE's Finally Get Organized! Checklists.